The history of WALTER Werkzeuge began almost 100 years ago – a history with a long-standing tradition. In 1919, the founder Carl Walter began to set entirely new standards when it came to the manufacture of tools that are 100% reliable. For him, uncompromising quality and innovation were top priorities. Since its foundation, the company has constantly evolved without losing sight of its core values. 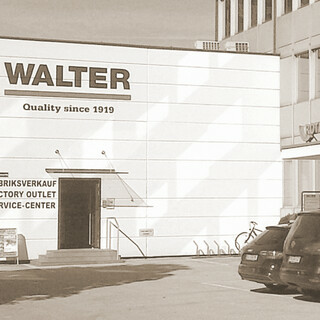 To this day, WALTER Werkzeuge is known for its innovative products – always guided by the customers’ wishes and needs! In 1919, Carl Walter laid the foundation for WALTER Werkzeuge with the construction of his screwdriver factory in the North-Rhine-Westphalian city of Wuppertal. From there, he managed the production and distribution of high-quality tools. In 1943, the founder built a branch office in Grödig near Salzburg. What followed were several decades of rapid growth. The economic miracle years caused an incredible boom throughout the entire sector, but especially at WALTER Werkzeuge. In 1972, the company moved to Anif. The modern building served as a symbol of progress and innovation. In 1988, WALTER Werkzeuge merged with the family-operated ROTHENBERGER Group. Due to this merger, WALTER Werkzeuge gained a strong international partner and their network to rely on throughout the process of expansion. ROTHENBERGER in turn broadened its product portfolio by a tool and machinery range for the DIY sector. Up until now, the importance of the WALTER brand continually rises in both national and European markets. The high-quality products, their competitive prices and the easily accessible location near Salzburg contribute to the company’s success.